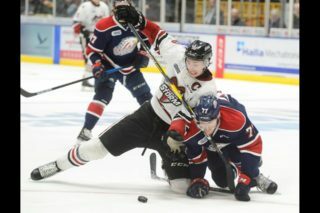 Zac Leslie had an assist and the overtime winner in the Guelph Storm’s 3-2 victory over the Plymouth Whalers on Saturday night. Starting the game off slow, the Guelph Storm were the definition of the comeback kids in Plymouth on Saturday night. Tyler Bertuzzi found the back of the net twice in a four-minute span late in the third period to knot the game up at two. With goaltenders Justin Nichols and Alex Nedeljkovic ensuring the game made it to overtime with incredibly stubborn performances, Zac Leslie would earn the game winner in extra time to give the Storm their fifth straight win. With the loss, the Whalers have now dropped their last seven games. Struggling to get their legs going to start the game, the Storm allowed the Whalers to gain some momentum early. Nichols turned aside 15 shots in the first, including several noteworthy stops to keep the game scoreless throughout the period. Trying to capitalize on fast-paced offensive pressure, the Whalers’ Francesco Vilardi would be found waiting at the backdoor alone, but whistled one just past an open net minutes into the game. Taking the first penalty of the match-up would be Tyler Boston, awarded two for crosschecking. However, negating the penalty a mere two seconds later, Victor Crus Rydberg took an interference penalty at the 5:26 mark of the period, setting the groundwork for four-on-four hockey. Two less skaters on the ice opened the contest up, adding some extra speed to an already fast-paced opening period. With just over ten minutes to go, the Storm started to get things going offensively with Luke Cairns leading the charge. Cairns would put three cracks on Nedeljkovic in tight, but wouldn’t be able to convert. The trio of Adam Craievich, Chadd Baumann, and Marc Stevens followed suit, creating more chaos in front of the Whalers’ netminder, although unable to capitalize in a scoreless period. With the Storm steadily finding their game, Nichols remained strong in the blue paint. Liam Dunda would cut in off the wing throwing a threatening shot on goal with minutes remaining in the period. Coming up with a timely save, the Storm netminder would slide out the right pad to stay perfect on the period. Plymouth maintained their energetic play right out of the gates of the second with Mathew Campagna wiring a shot off the iron just two minutes in. Minutes later, Phil Baltisberger would be given a minor for cross checking. On the penalty kill, the Storm would end up on a three-on-one rush with Leslie in alone on Nedeljkovic. The Carolina Hurricanes prospect would just get a piece of the attempt, keeping the game 0-0. The Whalers would come back the other way, though, with Sonny Milano notching the contest’s first marker on the power play from the top of the face off circle. Milano used bodies in front of Nichols for the screen. Immediately following the goal at the 9:49 mark of the period, Matthew Hotchkiss and Nicholas Caamano would get into an altercation, with each player receiving a five-minute major and a game misconduct for fighting prior to, or at the time of a puck drop. Minutes later, despite the 1-0 deficit, Nichols would continue to be a game-changer between the pipes. Milano and Matt Mistele would connect in front of the Storm netminder, however, Nichols would come out on the aggressive, making the save with his mask. To end the period, the Whalers would lead on the scoreboard 1-0, and the shot clock 25-17. Plymouth wouldn’t change much heading into the third period, maintaining the same strong offensive pressure. Keeping the Storm in it, Leslie would come up with a big defensive play to break up a threatening Whalers scoring chance around the 16:00 mark of the period. Plymouth proved to be relentless, though, with Liam Dunda feeding Vincent Scognamiglio for his third of the season from behind the net just over a minute later. The Whalers didn’t let up following the goal, creating all kinds of chances in front of the Storm net. Nichols would be successful in fending it off to keep his team in the game. With no quit in their game, the Storm climbed back into things at the 9:17 mark of the third thanks to a five-hole tally from Bertuzzi. Pius Suter would add the helper. Hard work in the offensive zone by Luke Cairns to keep the puck onside would lead to Bertuzzi’s second goal of the night exactly four minutes later. Leslie would notch his 100th career-OHL assist on the tying marker. With minutes remaining, the Whalers and the Storm would exchange chances, but neither goaltender would budge. Cairns had the most notable chance in regulation, as he was set up all alone in front off the rush. Ensuring overtime was needed, Nedeljkovic turned away the opportunity with a quick pad save. Leslie was a man on the hunt in the extra period. Setting the tone for his overtime winner, the overage defenseman created two strong offensive attacks in the opening minutes. Unable to capitalize, Leslie would return with a solid individual effort, cutting in off the boards to pocket the overtime winner. Bertuzzi and Noah Carroll recorded the assists on the goal. With two goals and an assist, Bertuzzi would receive first star honours, while Leslie was recognized as the game’s second star. Nichols undoubtedly deserves honourable mention, turning aside 33 of 35 shots, most coming when his team needed it most. At the other end of the ice, Nedeljkovic also had a strong performance between the pipes with 32 saves on the night. On the game-tying goal scored by Tyler Bertuzzi, Zac Leslie registered his 100th career-OHL assist. Todd Harvey was selected first overall by the Plymouth Whalers in 1991. Guelph’s Assistant Coach was honoured in a puck drop presentation prior to the start of tonight’s game. The Storm have now won nine of their last ten games played, including five-straight victories. With the loss, the Plymouth Whalers have dropped their last seven games. 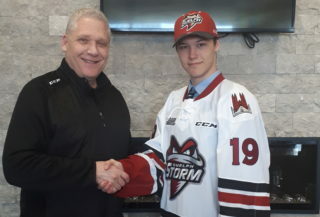 Tonight’s game marked the OHL debut for Guelph Hurricanes forward Sam Natale. Natale wore No. 16 in crimson. Guelph was without Robby Fabbri and Jason Dickinson, who are away at Team Canada’s World Junior evaluation camp. Also not in the Storm fold for tonight’s match-up due to injury included: Garrett McFadden (jaw injury) and Chris Marchese (broken finger). 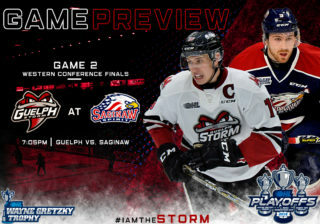 The Storm close out the three-in-three weekend Sunday night at the Sleeman Centre when the Oshawa Generals visit for a 6:30 puck drop. Penalties-Boston Gue (cross checking), 5:24; Crus Rydberg Ply (interference), 5:26; Campagna Ply (cross checking), 19:18. 2nd Period-1, Plymouth, Milano 8 (Crus Rydberg, Mistele), 9:41 (PP). Penalties-Baltisberger Gue (cross checking), 8:02; Hotchkiss Gue (fighting, game misc-fight prior to or at puck drop), 9:49; Caamano Ply (fighting, game misc-fight prior to or at puck drop), 9:49; Sills Ply (inter. on goaltender), 17:13. 3rd Period-2, Plymouth, Scognamiglio 3 (Dunda, Vilardi), 5:23. 3, Guelph, Bertuzzi 18 (Suter), 9:17. 4, Guelph, Bertuzzi 19 (Leslie), 13:17. OT Period–5, Guelph, Leslie 4 (Bertuzzi, Carroll), 4:00. 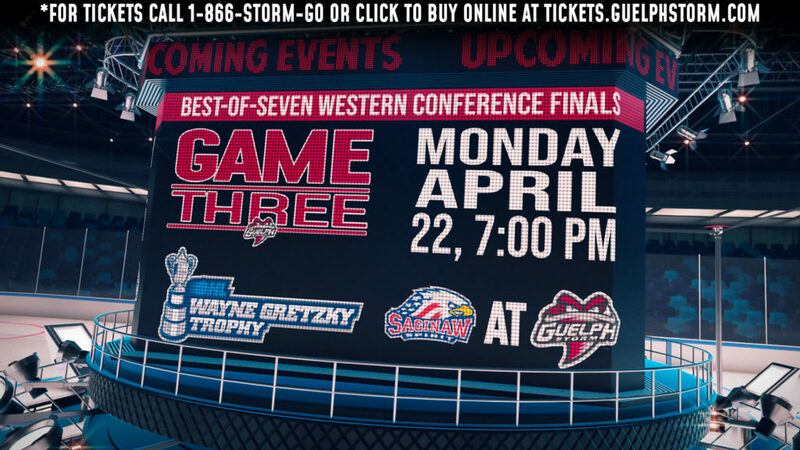 Shots on Goal–Guelph 10-7-15-3-35. Plymouth 15-10-8-2-35. Power Play Opportunities-Guelph 0 / 3; Plymouth 1 / 3. Goalies–Guelph, Nichols 18-8-0-1 (35 shots-33 saves). Plymouth, Nedeljkovic 9-14-2-1 (35 shots-32 saves). Referees-Bob Langdon (7), Shawn Hamelin (28). Linesmen-Drew Jackson (57), Chad Petrie (77).